ATM skimming is when criminals place a device on the face of an ATM, which appears to be a part of the machine. It’s almost impossible for civilians to know the difference unless they have an eye for security, or the skimmer is of poor quality. Often, the thieves will hide a small pinhole camera in a brochure holder near the ATM, in order to extract the victim’s pin number. Gas pumps are equally vulnerable to this type of scam. A customer at a New York City bank discovered a skimming device on the face of an ATM and went inside the bank to inform the branch manager. The manager, who had never seen an ATM skimmer and wasn’t sure what to do, took the skimmer and thanked him. The customer then remembered, from numerous reports about ATM skimming, that there is usually a second part to the ATM skimmer, the camera. In this case, he found it behind a small mirror that alerts the ATM user to beware of “shoulder surfers.” He brought the camera to the bank manager, who replied by saying, “Maybe we should shut that machine down, huh?” The bank manager contacted bank security, shut down the machine, and alerted other area banks. Skimming is one of the financial industry’s most difficult crimes to protect against. 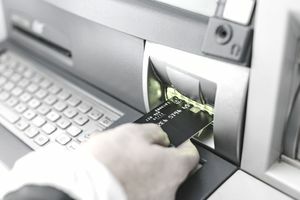 At one time the worldwide ATM Industry Association reported over $1 billion in annual global losses from debit/credit card fraud and electronic crime associated with ATMs. It’s simple enough to hack into a database and compromise cards and pins. It’s even easier to affix hardware to the face of an ATM machine and do the same. Once the data is compromised the identity thieves clone cards and turn the data into cash as quickly as possible. ATM skimming comes in two flavors. In the first scenario, a device called a “skimmer” is placed on the face of an operational ATM. When a card is swiped, the skimmer records the data on the card, and a camera hidden in a brochure holder or security mirror records the PIN. Usually, money is dispensed and the user is none the wiser.